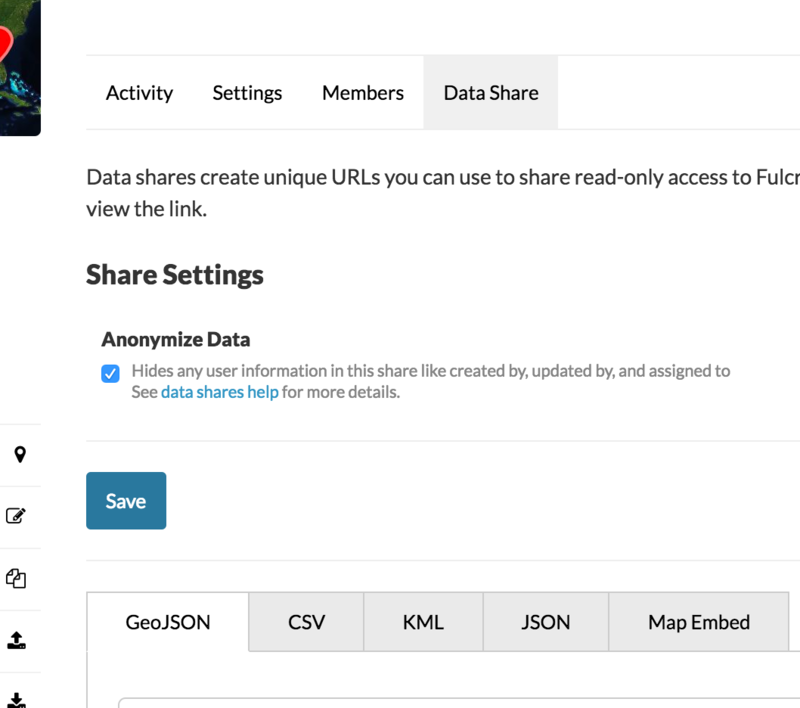 Creating data shares allows you to create publicly-available URLs for accessing data you have in your Fulcrum account, to share with clients, management team members, or even publicly via your website. When a data share is enabled for an App in Fulcrum, you’ll be able to select the data format type you want to use, and Fulcrum will display a URL for accessing that app’s data in that format. Anytime that URL is accessed, either inside a web browser or from another application or script, Fulcrum will return the latest data for that App in the format requested. This means users can bookmark the URL in their browser to have a readily accessible link to the latest data captured in Fulcrum, or you can write scripts to incorporate the latest version of the data by retrieving it from the URL. You can also use the link to download the App’s current dataset to your machine in that format for use locally. Note: You must have a role that allows you to manage Data Shares. The instructions to setup these permissions can be found here. By default data shares include information about who created the record, who last updated it, and who the record is assigned to. If you'd like to remove these user identifiable attributes check the "Anonymize Data" option. This is a powerful feature for transparency and data publishing. 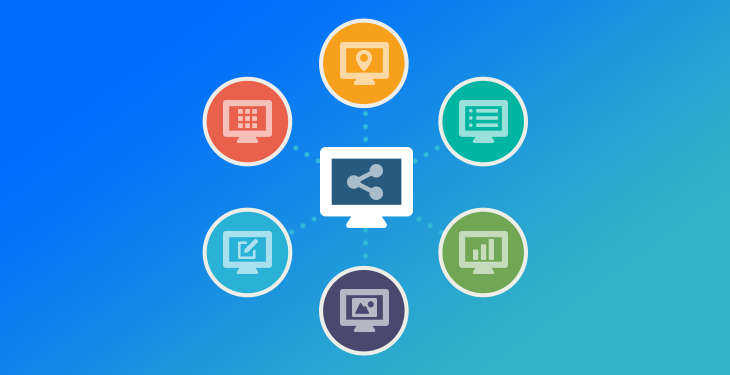 It also allows for easy access to specific data in a Fulcrum account for many cases where you may only need the data, and is simpler to use than the full API. A simple format that can be used with common office software like Excel or custom scripts for reporting and analyzing data. Your App’s data can be pulled from a CSV data share URL to automatically pull in your latest data at any time. GeoJSON is a common format for geospatial data that makes it easy to work across a variety of software. When using QGIS, for example, one can add and view a vector layer using the GeoJSON data share URL. The well-known KML format is supported by many desktop, mobile, and web clients. KML data shares can be opened in Google Earth for quickly visualizing your App’s data. This flexible format is like what you’d receive from the Records API endpoint. Many programming languages have tools to parse and use JSON data, which makes it a good choice for advanced, custom applications. Can be used to embed a map on your own website. Options allow you to display only the record details that you wish to share, and set display options like map clustering and different map views. Note: Make sure to click update after making changes to the settings. When using the JSON file format, all of the data (for parent and child data elements) is included in the body of data through a single URL, so you don’t need separate paths. Since JSON format would typically be used for custom applications or software tools, a JSON parser can be used to determine nested parent-child data relationships. Data shares automatically include special URL fields for accessing associated media files. This URL field makes it easy to view multiple files that may be associated with a single field, by taking the user to a single landing page. If you’re a developer, you can read the documentation for details about customizing the data returned from the data share URLs.